In December 2017, I completed a Master's in User Experience Design at the Maryland Institute College of Art (MICA). 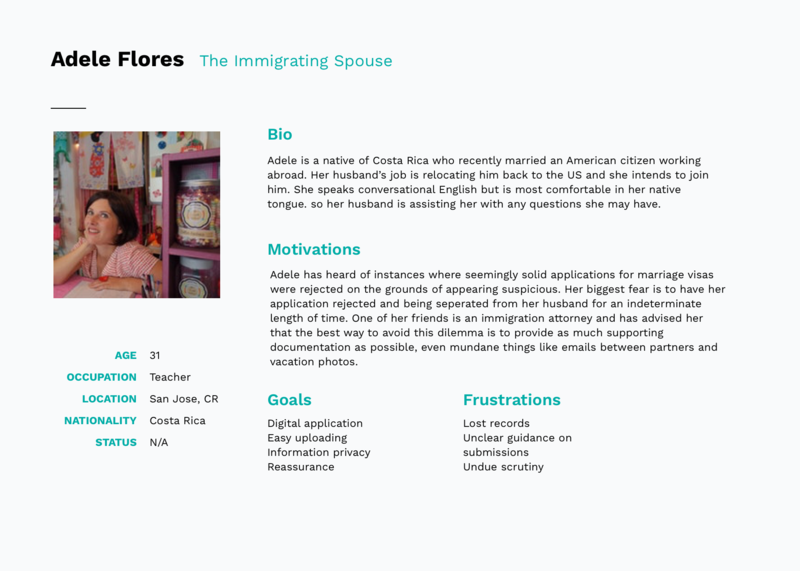 For my thesis project, I explored how to translate immigration application paperwork into a more user-friendly format using conversational interfaces. Few people enjoy filling out paperwork, and even fewer enjoy government paperwork. Forms are tedious and old-fashioned, and they often accompany a particularly byzantine process. But they surface infrequently enough that we're able to tolerate them for a few hours now and then before moving on with our lives. Not everyone has that luxury. For immigrants applying for residency or naturalization status in the United States, incomplete or inaccurate paperwork can result in life-altering consequences. The rejection of an application can deny someone opportunity, security, or a reunion with loved ones. And until a Supreme Court ruling in 2017, innacuracies on an immigration application — even if unintentional — could be grounds for prosecution. 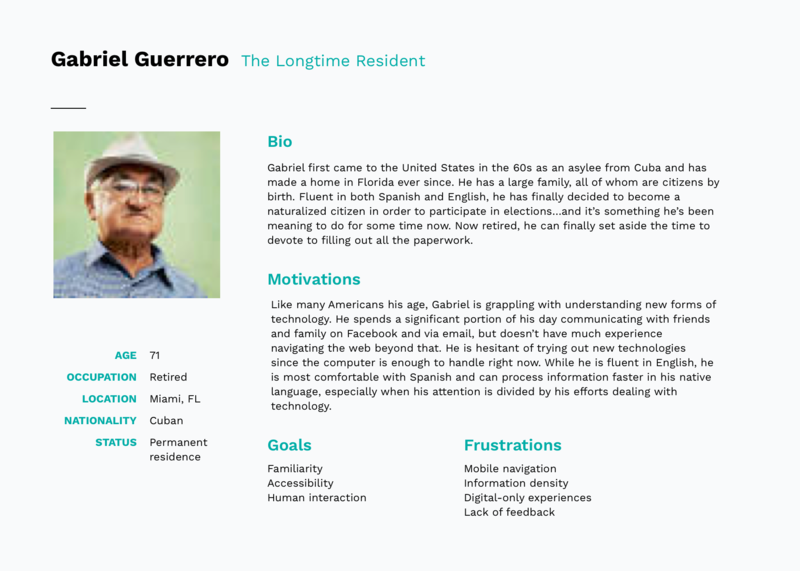 For my thesis project at MICA, I chose to explore how we might apply principles of usability and interaction design to create new digital experiences for those seeking to become residents or citizens of the United States. In the absence of fully digital and usable federal paperwork, software solutions have arisen to assist people in other bureaucratic matters, such as preparing taxes or managing a business. A similar approach ought to be applied to the immigration process, where frustration with paperwork can complicate an already-stressful process for a particularly vulnerable audience. I conducted user research by interviewing five people with firsthand experience in applying for residency or naturalization. Participants included three immigrants hailing from Cuba, Nicaragua, and India: one a naturalized citizen, the other two permanent residents by marriage. The remaining two were US citizens who assisted their spouses with their applications. Interviews consisted of about 25 questions covering their experience with various immigration processes, their comfort with technology, and retrospection on how they might improve the process given their experiences. Applicants typically resided in the US for several years before applying for a change in status. Most had held multiple different visas before becoming permanent residents or citizens, including refugee, student, employment-based, and marriage visas. Several mentioned family members who were permanent residents that decided applying for naturalization wasn't worth the effort. Government is a “black box”; after submitting an application, months of uncertainty would pass before receiving further word from USCIS. The process was invasive, as officials often required applicants to submit personal communications with their spouses as proof of their relationship. Outside help is often necessary, but trust is an issue. Word of horror stories about immigration scams traveled through immigrant communities, and there was some apprehension of third-party services. 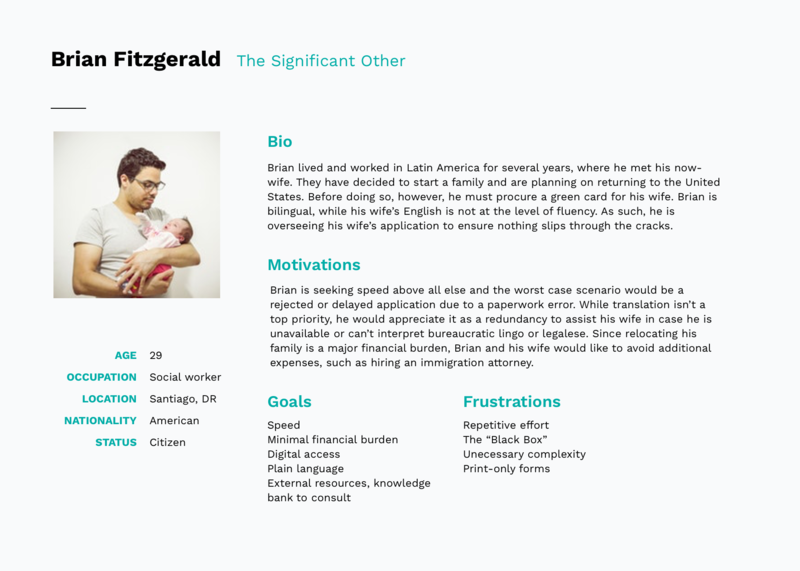 Applicants aren’t the only users — citizen spouses, lawyers, translators, and social workers often assist in filling out documents and testimonials. In many cases, digital forms fail to overcome the challenges posed by paper ones. Simply creating a digital facsimile wouldn't suffice. My initial exploration & research pointed me toward conversational interfaces as a solution, since they rely upon progressive disclosure — the method of only exposing immediately relevant information to a user at a given time. 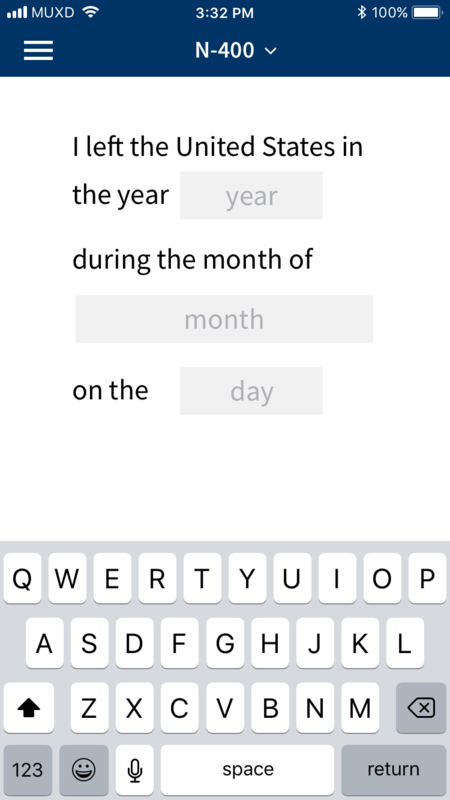 This reduces cognitive load in users, making complex tasks more manageable and thereby easier to complete. 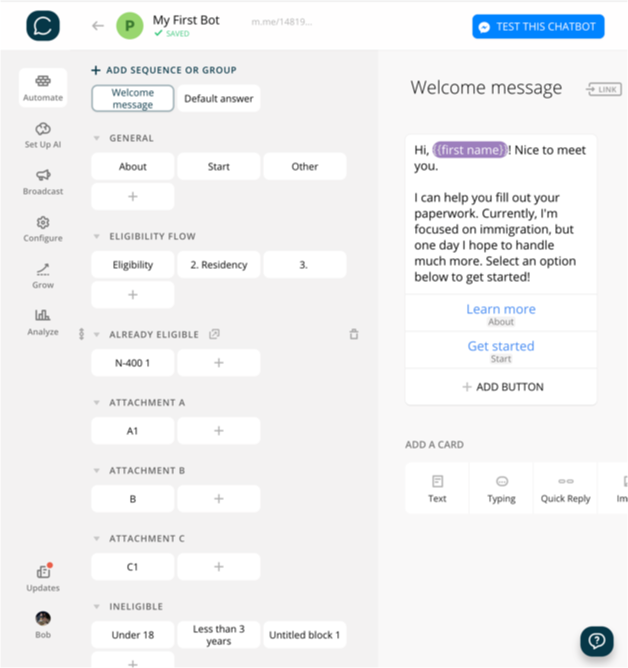 I propose an alternative to immigration paperwork in the form of a conversational interface. By re-contextualizing traditional paperwork into a question-and-answer format, we can use familiar language and interaction patterns to provide users with a personalized experience that is approachable and stress-free. I experimented with three different types of conversational UIs: chatbots, wizards, and natural language forms. 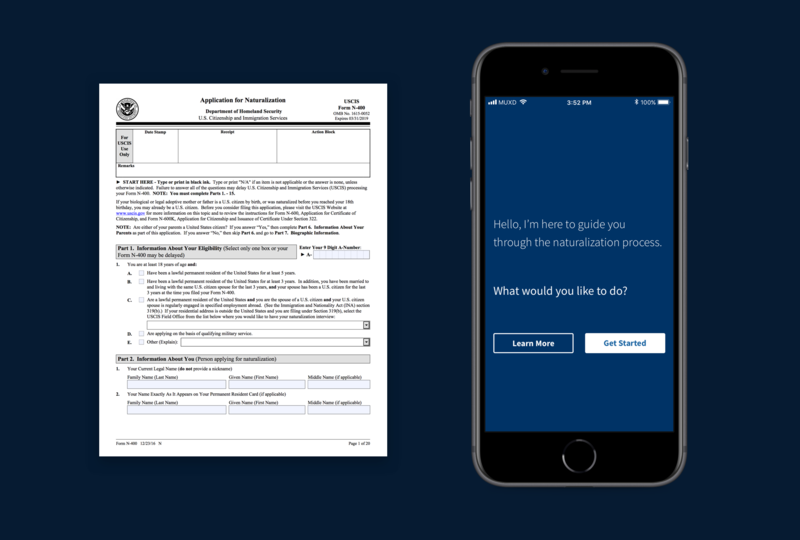 As a test case, I rewrote sections of the USCIS Naturalization Eligibility Checklist with more conversational copy and developed several prototypes. 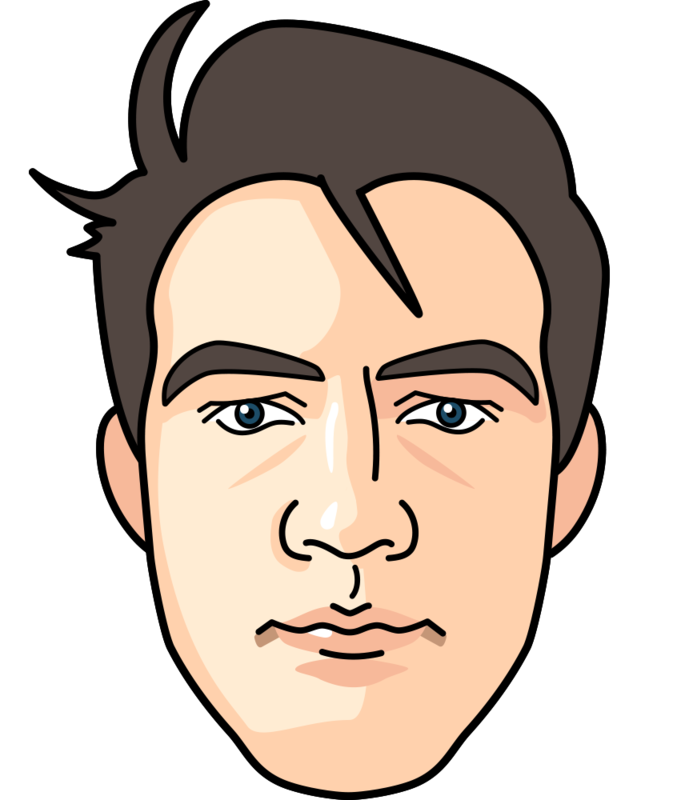 Simulating human conversation with a Facebook Messenger chatbot made with ChatFuel. This let me experiment with branching questions and friendly, casual language. 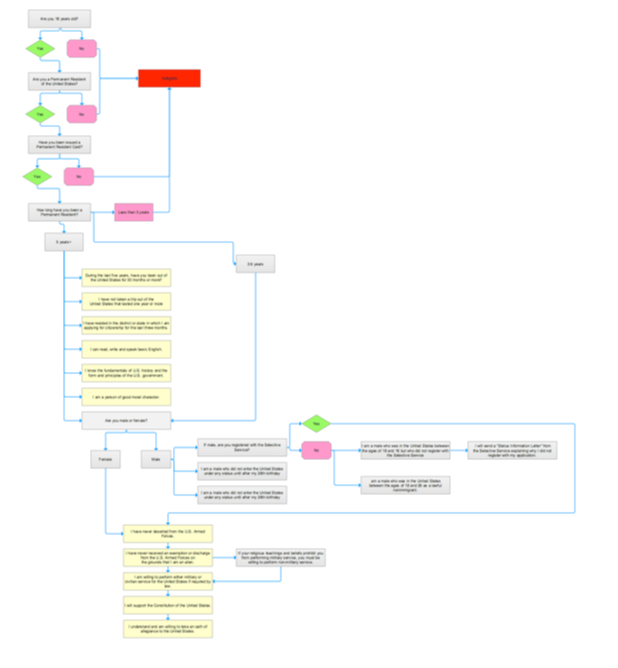 A wizard is a digital process that assists users in accomplishing a single task by breaking it into a series of steps that follow a prescribed order and presents information based on prior user input. I used Twine, an open-source tool for creating text-based narrative experiences, to mimic this format. 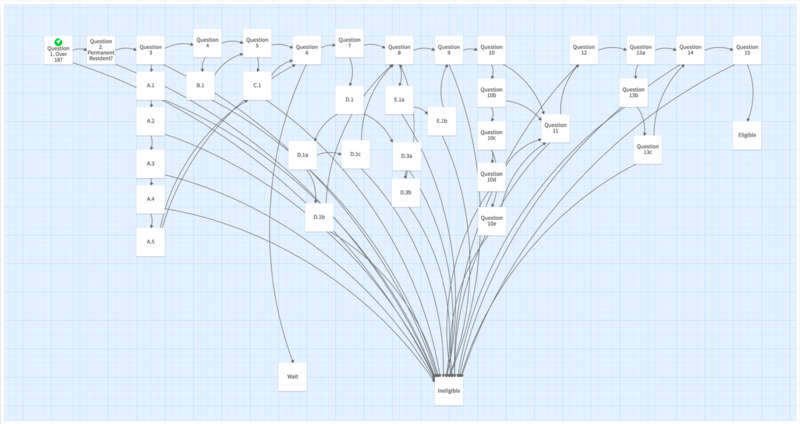 The output was seemingly minimalist, but Twine's branching logic features and the visual flow editor made this prototype fully-functional. Check out a live demo here. Next came a round of user testing pitting the Twine wizard against my Facebook messenger bots. I was looking to determine which interaction pattern enabled users to complete the task the quickest, and also gauged users' subjective attitudes toward the input methods, tone of voice, and ease of use. “The chat paradox”: While chat was more familiar to users, it felt unofficial and potential risky. This was someone’s entire life - could they trust this service? The biggest revelation from user testing was that conversational interfaces (or at least my means of reproducing them in prototypes) simply weren't advanced enough to give people the impression that completing a complex form was as easy as chatting with an old friend. By forcing everything into a conversational format, I was arbitrarily limiting users. In some cases, plain old HTML inputs might be more effective than both a chatbot and a paper form, and my conversational approach had discounted them from the outset. 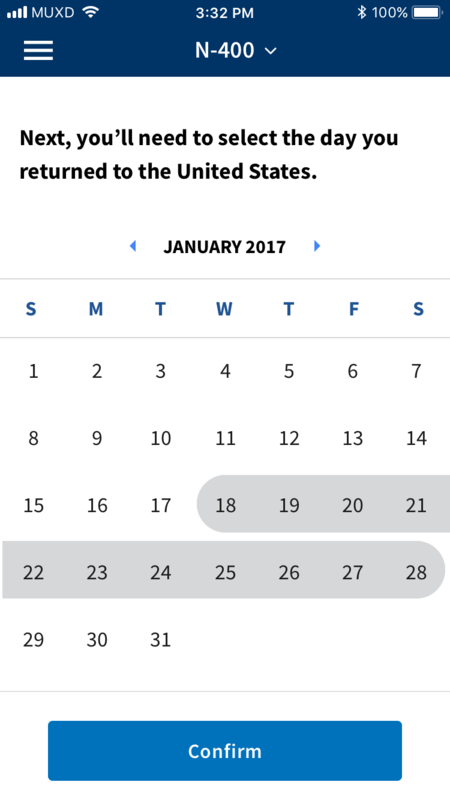 For example, a portion of the N-400 form asks applicants whether they have left the United States for an extended period in order to determine whether they can be considered permanent residents. If someone has been on multiple foreign trips, they must fill out additional follow=up questions. 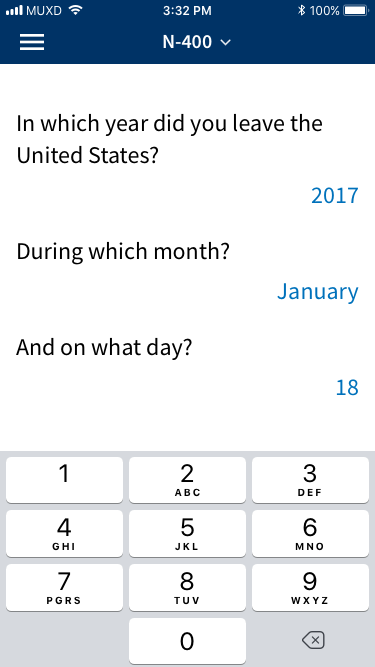 My initial instinct was that this followed the natural flow of a conversation, but it would be better to let content dictate the input type: for entering a year, use a native numerical keyboard; for choosing the month, allow for typing and provide a list for quick selection; and for selecting a date range, a traditional datepicker is superior to a chatbot or a natural language form with multiple fields. Users did, however, respond to progressive disclosure — validating the core of my hypothesis. So I then sought to create & test a hybrid UI with N-400 content that synthesized the well-recieved qualities of the two earlier prototypes along with some more traditional form elements. My aim was to instill confidence by increasing the fidelity of the prototye and employing a more restrained approach to the conversational aspects, dialing up the formality and using it only when contextually appropriate. Eventually, I settled on using the US Web Design Standards to guide my visual design, as I realized matching the look & feel to federal websites could ameliorate the perceived insecurity presented by the Facebook Messenger bot.